What can we learn about aging from the resting brain? What is resting state fMRI (rsfMRI)? It is a method of functional neuroimaging where a researcher records brain activity while a participant lies down in an MRI scanner and simply rest without engaging in any specific task. You may think that the brain is not very active at rest. But in fact, the brain is still active and we can learn a lot from the resting brain. rsfMRI is a powerful tool to study brain function. Why is rsfMRI so valuable? While you are at rest, a set of brain regions fluctuates spontaneously and coherently at low frequencies – this is known as a ‘resting state network.’ Researchers describe co-activation of a set of brain regions as ‘functional connectivity’ since these regions may not be anatomically connected but functionally connected. Importantly, resting state networks closely match brain networks activated while you are engaged in a task. For example, the right fronto-parietal network fluctuates together at rest as well as when you are engaged in a cognitive task (e.g., n-back task). Thus, resting state and task-related networks go hand in hand. How do resting-state networks change as we get older? 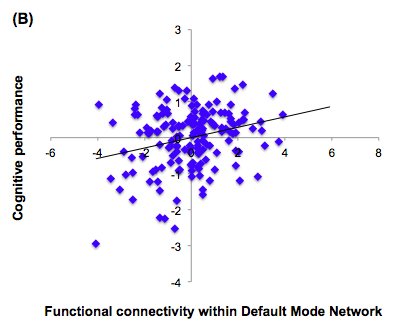 Previous research suggested that some resting state networks decline with age (i.e., functional connectivity gets weaker with age). This may not be surprising given that cognitive function typically declines as we get older. But do all resting state networks decline with age, such as those associated with visual, motor and emotion functions? The answer to this question remains unclear. Particularly, little is known about how aging affects emotion networks. We examined which types of resting state networks may change with age and how it relates to performance (Nashiro et al., 2017). We were particularly interested in how aging might differently affect cognition vs. emotion networks given previous behavioral research suggesting age-related decline in cognitive domains (Park, 2000; Salthouse, 2010) but preserved emotional processing in aging (Mather, 2016). 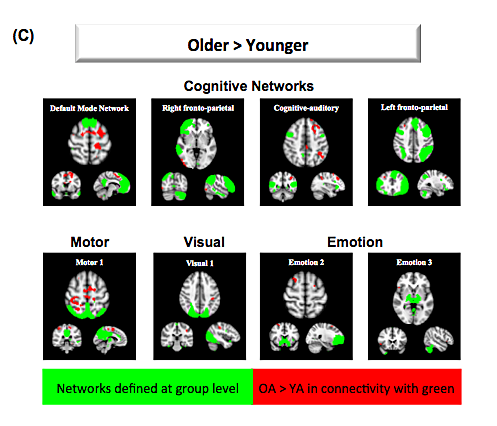 • Age-related decline was observed in cognitive, motor and visual networks but not in emotion networks (see A below). 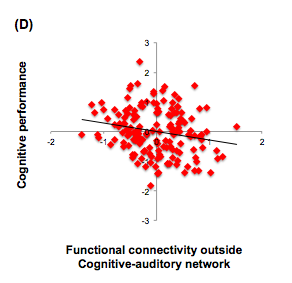 • Greater within-network connectivity was associated with better cognitive performance (see B below). 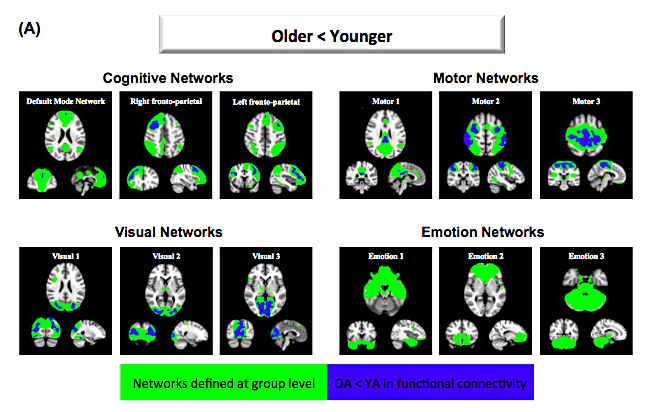 • Relative to younger adults, older adults showed increased functional connectivity in regions outside networks (C), which was associated with poorer cognitive performance (D). What did we learn about aging from the resting brain? Our results suggest that all types of resting networks decline with age except for the emotion networks identified in our study. Age-related preserved emotional function may be able to facilitate older adults’ cognitive performance. For example, previous research suggests that mindfulness training, which focuses on improving emotional well-being, can also enhance executive function (Tang et al., 2012). Mather, M. (2016). The Affective Neuroscience of Aging. Annual Review of Psychology, 67(1), 213–238. Nashiro, K., Sakaki, M., Braskie, M. N., & Mather, M. (2017). Resting-state networks associated with cognitive processing show more age-related decline than those associated with emotional processing. Neurobiology of Aging, 54, 152–162. Park, D. C. (2000). Cognitive Aging: A Primer. Taylor & Francis. Salthouse, T. A. (2010). Selective review of cognitive aging. Journal of the International Neuropsychological Society, 16(5), 754–760. Tang, Y.-Y., Yang, L., Leve, L. D., & Harold, G. T. (2012). Improving Executive Function and its Neurobiological Mechanisms through a Mindfulness-Based Intervention: Advances within the Field of Developmental Neuroscience. Child Development Perspectives, 6(4), 361–366. ← Briana Kennedy and Kelly Durbin win NIH fellowships!